once upon a time lived Tif, it was many moons ago and she was misplaced and some may say, quite positively lost in a land of reproduction furniture and fancy front living rooms. one day, Tif found herself pottling in the book store as she was apt to do, of a friday afternoon with a young clan. she thought it most nice of the book folks to place the children's books next to the craft and interior books. as she perused the shelves whilst glancing over at her clan from time to time, her little beady eye spied 'flea market style' upon the shelves of creative goodness. Tif gasped 'thee gasp'... upon taking down this peachy book and beginning to turn the pages, she knew this was a wonderful happening to outdo all happenings that had ever happened to her in a book store before. After several page turns, it became quite apparent to Tif she was no longer alone and lost with her granny chic loving ways. Tif clutched her 'find', indeed hugging it like an old friend, she then rustled up her little clan and headed home to her cookie cutter new build in Edward ScissorHand land. from that day forward, Tif kept her little 'flea market style' book by Emily Chalmers on her bedside cupboard. some days when she was a little lost, she would open it and lose herself amongst the pages. it was late, Tif was a little punch drunk from writing most of the day on and off, in a moment of madness whilst the clan slept above her head she wrote to Emily Chalmers, introducing herself and her world of dottie angel, telling Emily of her admiration for her lovely books and then she ended her letter with some high hopes. (i have put that in because all good stories need a bit of pacing and hand wringing). the following day, after the morning after, Tif glanced at her emails and then she felt a little giddy, she sat down calling Used Dog and Little Olive to her side, for indeed a moment such as this must be witnessed. there in Tif's little inbox was Emily Chalmers no less and even more incredible were the words Emily had tippity tapped the other side of the pond in her lovely nest. after some nattering, Emily and Tif discovered they had quite a bit in common, those bits including a love of second hand goodness, furry friends, sharing the same age, kindred spirits and believing in fate, oh yes and they both liked grannies. and so it came to pass, Emily and her lovely self, thought Tif's high hopes were perfectly achievable and spent her time wisely with pencil and scrap of paper in pocket waiting for moments of 'brilliant thoughts' to hit. at any given time Emily could be seen scribbling her little 'brilliant thoughts' upon her paper, then safely tucking it away whilst she went about her busy creative days in Caravan and elsewhere. 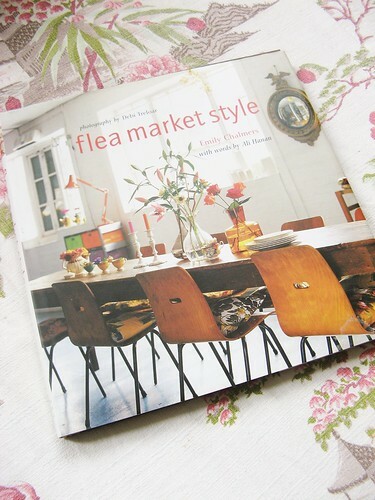 Ooh, Tif- I loev Flea Market Style and it's fantastic to read how it inspired you. This foreward is just the icing on the cake - I'm so glad you were brave enough to write to EC! How exciting for you! Can't wait to read your book! Ahh, what a lovely and most satisfying story!! Big congratulations. How very, very exciting. Can't wait for your book!! Maybe it will make a flea market-er out of me yet : ). Oh how lovely Tif. I know how well "a shall I, shan't I, she'll think I'm mad, I am mad" high hopes can have the most peachy result. Hi Tif, have a GREAT SPRING! My compliments for your blog!!! Such a wonderfully happy ending! I like this story quite a lot. how amazing and wonderful! this story makes me so happy for you! and happy for me and everyone else who will be buying your book as soon as it makes it's appearance! you are an inspiration. congrats on the book and thank you for sharing your journey. On a day where there has been nothing but sad sighs, frumpy frowns, and aching anger....this little Dottie Ditty has made me SMILE. :) Thank-you SO much...what a gift that was! Well. May I first say that I am so happy to be (I think) the first to comment. Dottie Angel, your posts always have a certain unique creative lift to them. I'm pretty sure that folks like me who live far and wide away from you really do look forward to seeing what you'll post. As we read your posts, our inner thoughts might encourage us to try some creativity for ourselves. You really do have a lofty, friendly and encouraging voice. Thank you for every post. Let's keep the chain of creative inspiration and productivity going! ah, this is the stuff of dreams. thanks for sharing a high hopes tale that gives us all high hopes that dreams do often come true thanks in part to nice people who are encouragers of others! tif is a lucky duck. Oh Tif, this is the first time I've commented on your delicious blog and this time I feel I MUST. How absolutely wonderful and special that Emily Chalmers has agreed to write your foreward!!! I can completely understand the tears. Oh, congratulations you! I also have this scrumptious book and look forward to it arriving along with all of our other belongings from across the ocean from Australia to.... Texas. Thankyou for your dear and lovely blog. to the book and this is the icing on the cake. wow. if your book is ging to be anything like emily chalmers (no doubts there), than i will be going through exact described feelings of elation as i felt, when picking up fle market style myself, years ago... must dig that book from one of my removal boxes then, hey? have a safe journey. looking forward to the publishing of. todays blog is my fav post. I can name my "style". Hooray for you and your kindred spirit! This is so so so so exciting !!!! I am so happy for you! What a lovely tale.